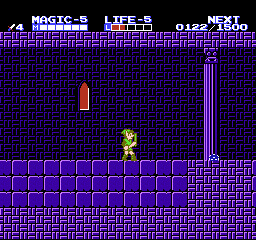 Some weeks ago user @njosro started a topic about his Zelda II - Restart from Palace hack, which makes it so that the game restarts you at the start of a palace you currently are after a Game over or Continue. This inspired me to further hack Zelda II to more or less alleviate the most obnoxious things which takes away from making Zelda II a more enjoyable experience. Reduced the amount of HP the Bubble (and Giant Bubble) enemies have, as well as their Exp. Should now go down with like 10 Sword swings instead of a damn million (having FF in their lives was really something stupid for such a meaningless enemy), and they have also been made non-respawnable to avoid abusing grinding of these enemies, since their low EXP could still be abused. Pausing the game on the Overworld now gives a "PAUSE!" message right above Link, like in the GBA port. Picking up a Link Doll now adds a life to the total amount of lives you start the game with (restart), making the Link Dolls more useful instead of just having its benefits present until you hit a game over. Life counter caps at 9, but you can still gather more lives via the 9000 Exp method, the counter simply won't go past 9. Saria brige now appears automatically after giving the Guard the letter for the first time. You no longer need to talk to him every time you want to cross over. Changed the "-" in the file select alphabet to "/"
Add a "PAUSE" message when pressing Start on the overworld Thanks to IcePenguin for this! Re-arrange the HUD to be more attractive to the eye. Thanks to IcePenguin yet again! 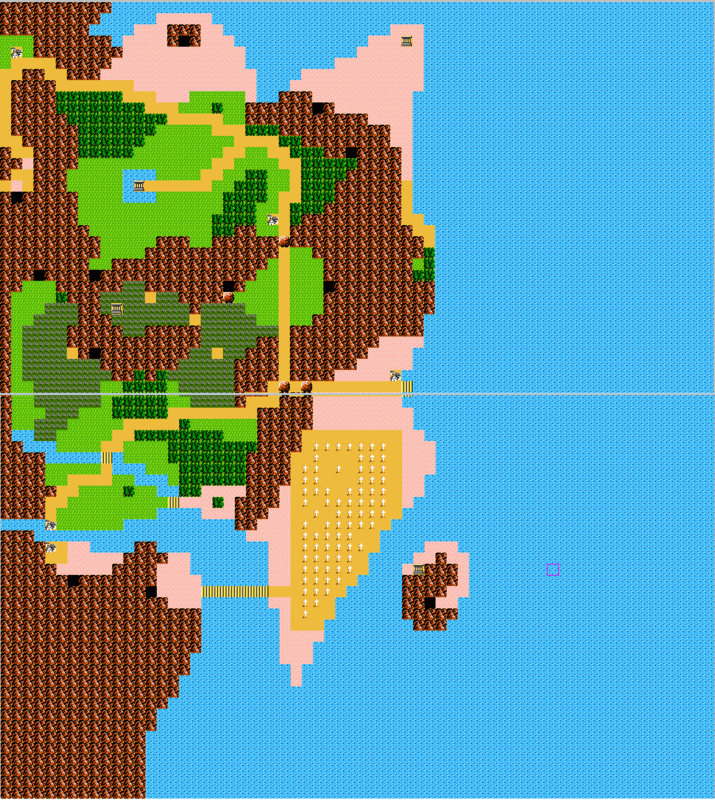 Overworld animation is now working thanks to Trax. Restore the Dragon Quest reference. Currently, the exact spot where the textbox for the reference is triggered in the Famicom version is not there, a hotspot would need to be made for it as well as a new text entry for it. Thanks to njosro for explaining how to implement it through his hacking tool! 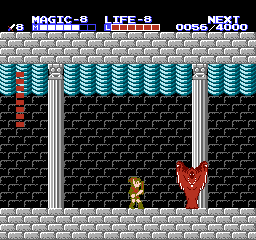 I am also seeking out for suggestions and things that could make Zelda II a better experience over all. If you have any suggestions, please feel free to post them here! I'll analyze them and try to add them if I feel fit. I'll try to focus on 1) Rebalancing the game, 2) Modify stuff which is already obnoxious in-game, 3) Perhaps rewriting some lines which don't make sense in the game. Make it so Up/Down on the D-Pad moves the fairy cursor in the menus accordingly (File Selection and Elimination Mode). DarkSamus993 is currently working on this. Modify "Spell" spell name to something more proper. "Enigma" spell was chosen for the name. Rebalance enemies. This might take a while to do since I need to know WHAT enemies and HOW to balance them properly to give a proper balanced experience and not a too easy/too hard one. Change in-game text to something better translated/localized. All the things you listed sound great so far, if I could add any one thing to it, I would speed up the NPC text. I personally didn't mind the exp stealing enemies that much, maybe it could be an optional feature. Oh the text speed is one that I haven't even thought of. I gave it a try and I think I managed to make it much more fluent and faster. Give that one a try and let me know what do you think about it. The only downside with that is that now the Typewriter sound goes way faster and sounds like a raspy thing instead. I could remove the sound, but it sounds way too empty in between textbox sounds. If you want to hear how it would sound without the Typewriter noise, open up the ROM in a hex editor and change the byte found at 0xF757 from 60 to 00 (so that it doesn't make any sound). Other sounds in between are the laser from the sword sound and the death sound. As for your recommendations PresidentLeever, I am interested in rebalancing some of the Exp points given out by enemies, though I don't know which ones yet as I feel most enemies at the start do offer a considerable amount of Exp given the trouble they give to kill them. If someone has suggestions as to what enemies to change, please let me know. The beeping for the health is another one I might be interested in, as is the switching around some dialogue and more common enemy drops. I feel like changing the dialogue would be something I would do last, just so that I can focus only in that exclusively and not many things at once. 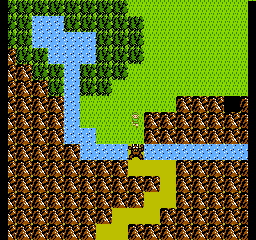 One last thing nothing, is that alongside graphics, I don't think I'll be changing the game's layout too much/at all. The only things I find annoying are the pits when you tend to fall to them by a knockback, but that's all that I can think of. You know,since we are making changes to Zelda II and make it less frustrating,maybe you can tackle of the Castlevania Nes Games? Nice, yeah I actually talked to someone else who did that with the text speed a while back and had the same issue so that's why I suggested the button press idea. But personally I'm fine with this too. Beat the first palace. I think 6 hits for the skull/bubble is a bit much given the exp they give? But standing and hitting them over and over isn't fun so maybe just reduce the exp they give to 25 or so (and keep 50 for the fast one). 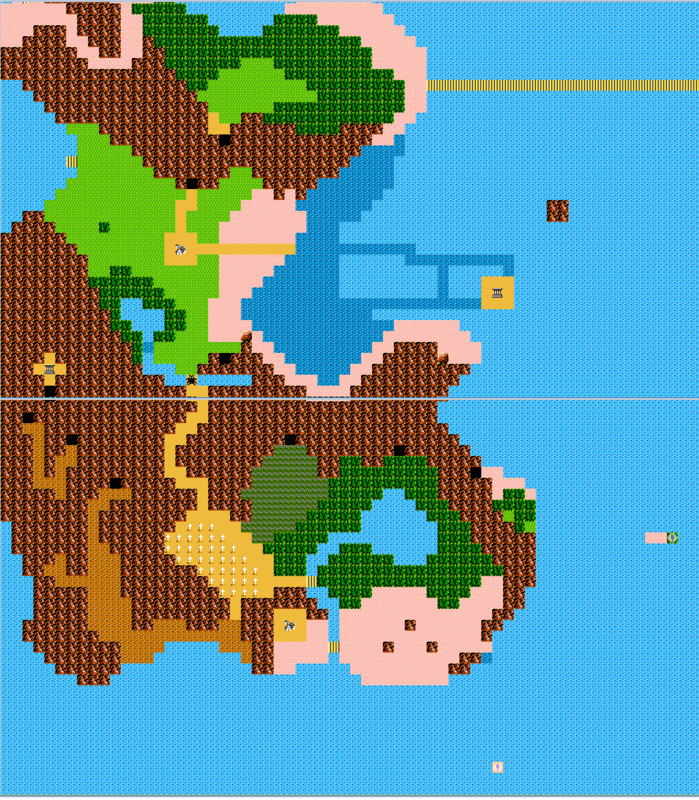 I wanted to do an improvement/rebalance hack using the editor earlier and as part of that tried to reduce the overworld size (to make it easier to spot item locations and reduce travel times), but ran into some issue with certain tiles in eastern hyrule. Ran into issues when changing the dialogue as well (there is a retranslation online that I used as reference). I also wanted to do much more, but couldn't, so it's great to see this taking shape now. I can try to explain the sword swing cancel in more detail, I think that would be a big improvement if fixed. Now this is a crazy idea and I don't expect you to go through with it, but what if you removed the overworked completely? It adds nothing to the game except needless confusion. 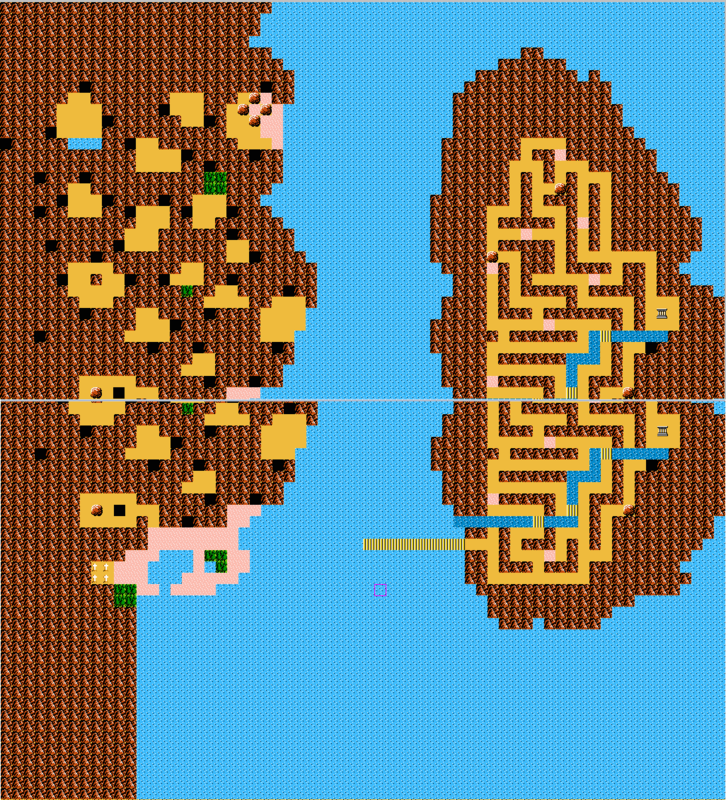 You could add branching path ways in levels that lead to different areas, it would sort of play like Castlevania II (except better). The manual save feature and less linear design that was mentioned earlier would complement this. Played for a bit, and it's really promising so far. I think the speedy text works great, the sound doesn't bother me at all. If you want to know about a certain enemy that needs rebalancing, I have a suggestion for Doomknocker. They throw maces that return to them like a boomerang... or at least that's how you expect it to work. If you kill doomknockers after they throw their maces, the maces will return to where they are and stay there for a bit, before going back into the direction they were thrown. This really messes with the player's expectations, and given that they've been placed over a few lava pits, this is a really bad move. If at all possible, i'd like to see that their maces return to the direction they were thrown from and keep going, like you'd expect of a boomerang type weapon. ShadowOne333, I'm a fan of all of your hacks and was really excited to see this and apply your prototype patch. My thoughts so far: if there is a way to totally cut off the sound with the sped up text, I think that would be the right direction. The static sound is a distraction. Also, with the hearts: I absolutely love the concept of switching out the life bar. However, my first visual impression of the dark blue background surrounding the hearts struck me as aesthetically off. I've gotten used to it the more I play but I think the first impression is important. My suggestion would be to remove the blue background all together, let the hearts stand directly against the area backdrop. When the hearts are emptied, perhaps they could be turned white? Thanks again for working on this. I'm sure I'll have more feedback as I get deeper in. Both great options. But if the hearts can't switch to white, I think I'd rather see the blue outline than have them disappear altogether. It also gives you that cool Ocarina effect. Oh right, something like this then? Either black or blue inside, click to zoom. When I mentioned white, I was thinking the solid red hearts could turn solid white when you lose them. As opposed to that, you could leave the blue outline of the heart and have them go black. However, based on this second image, black center white outline looks very good too. Might be the ideal scenario. I wouldn't have the hearts turn blue. I don't think there is a precedent in the franchise for that and it seems odd visually. 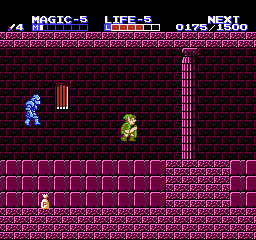 Well this mimics zelda 3 and link's awakening whereas that would look like zelda 1. But the blue in shadowone's version is probably a layer on top of a simple red meter that drains so it might not be doable. As for the heart meter, PresidentLeever is correct. While the mockups are nice and pretty, I ended up using the blue "mask" to cover up the effect the game uses to display the health. It's basically a red rectangle which drains, and it does so in a rectangle shape sadly. I struggled quite a bit because the game uses some kind of background colour for keeping track of the health, which is why I ended up putting a blue colour around the hearts so that this effect is not seen while in gameplay. 1) Four colours. Well actually three (white, blue and red) and a transparency one (background). 2) The background layer which keeps track of the health. It seems to be just one single 8x8 tile repeated several times, so I gotta e careful what to put there, and also make sure it is mirrored perfectly when the health drains, because the tile ends up moving left a bit. If I use another shape that's not a rectangle, it will overlap or go out of the heart-shape bounds. So yeah, sadly that's what I could do without having to redo the whole health/damage routines. I'm still thinking about what to do with the Magic meter though, not sure if I will make it one solid bar or keep it segmented as it is. Ok got it, yeah it's a shame you can't use a solid black as part of the mask there. But yours is still better than the original. I COULD use black, but that would mean sacrificing either the blue or white. Restore the roar sound effect from the FDS port. Make the level system behave more like the one from the FDS port. Rename the Trophy & Water of Life back to being called Goddess Statue & Holy Water once again. Restore the Dragon Quest reference in the cemetery from the FDS port. I love those suggestions by SCD. There are lots of advantages of the US localization but combining those with what was cut would make the perfect version of the game. Also, I came across a bug. 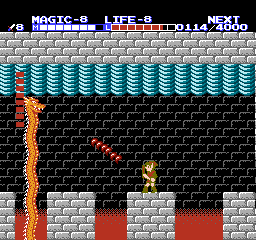 In the first temple boss battle, instead of the boss's life bar being divided into distinct sections as before, it all got mashed together into one vertical red bar. However when he loses life, the red bar is replaced by distinct white segments as per the original. But which localization should we base this reference on? Depending on the translation, the name in the English Dragon Quest game is either Loto or Erdrick.